This is the second recipe in our Valentine's Day Sweet Treats recipe series. 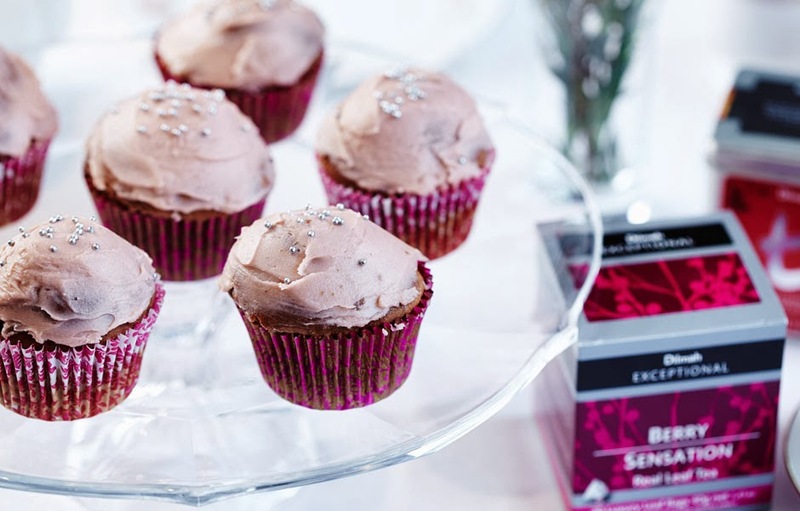 These tea-infused chocolate cupcakes are a really versatile base for decorating with any colour/flavoured icing you like. They would also look great decorated with cream and strawberries, or with a sprinkling of little sugar hearts on top. 1. Preheat oven to 180°C. Spray cup cake pans with cooking oil spray. 2. Sift flour, cocoa powder into a bowl. 3. Make ½ cup Dilmah Breakfast tea using 2 tea bags and hot water. Allow to infuse 10 minutes, cool in refrigerator. 4. With an electric mixer beat butter, sugar and egg together until combined. Fold half flour/cocoa powder and half milk. Repeat with remaining flour/cocoa powder, milk and tea. 5. Divide the mixture among the greased cup cake pans and bake for 15-20 minutes or until a skewer inserted into the centres comes out clean.